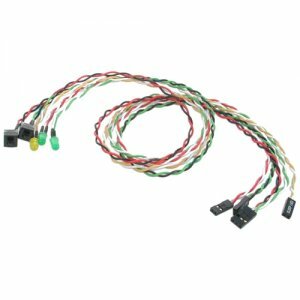 This Power/Reset LED wire kit is suitable for replacing burnt out LEDs and switches on a PC (ATX) Case Front panel. The five-piece kit comes with two switches (Power, Reset) and three LEDs (Power, Hard Drive Activity, Sleep). Each switch and LED is clearly labeled to make installation easy. The replacement Power/Reset LED wire kit offers a cost-effective way to keep your ATX computer case working the way it did when first purchased, without the expense of a new case.